Jabra Evolve 75: Wireless Active Noise Cancelling Headset | Avcomm Solutions, Inc.
Jabra has added the Evolve 75 headset to its Evolve series, and it was worth waiting for! Incorporating Active Noise Cancelling in the ear cups (like the Evolve 80), with a lighter weight fit and feel (similar to the Evolve 65), we believe that this headset will be a valuable asset to many — in the office and on the go. First, take a look at the premium hard-sided case that the Evolve 75 comes in. Imagine you're on a plane, and you've just touched down, so it's time to put your headset, phone, and book away. 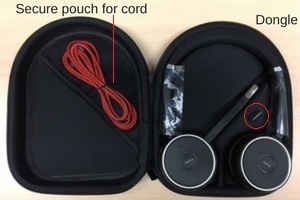 This case with molded inserts makes it easy to store the headset, and is protected by the hard outer shell. The easy-to-zip zipper is smooth to operate, and individual storage areas for the charging cord, and dongle, keep the case organized. Next, the Active Noise-Cancelling is the real deal. In our testing, we could not hear ourselves talk when we were wearing the headset and the ANC was on. 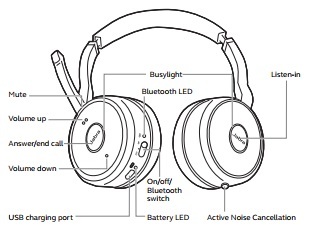 To quickly listen to the surrounding environment, simply press the Listen In button on the ear cup. To learn more about the Evolve 75, and which variant would be best for you, Chat us right now!